» Forum » Tech » Tech: Modern games » Dirty Harry Right Gate Loop Stuck Closed. » Dirty Harry Right Gate Loop Stuck Closed. Dirty Harry Right Gate Loop Stuck Closed. Hi ya'll, just got my first pin yesterday, it was working fine at the guys house who I bought it from, but I did a test on it and it said that the right gate loop gate is stuck closed. So this means I can't do the left loop to the upper flipper ramp shot cause the little metal gate stops the ball from going through. Any tips on how to fix this would be awesome. I'm a total noob at fixing these things by the way. Does the coil work in "coil" test mode? Well there is always stamp collecting. All you need is a tongue, stamp, and paper. But you decided to go all out and raise pinball hell. And here we are now. I do hope you know some basics, how to solder, how to use a meter, toilet seat up or down if you are married. If not consider Google or YouTube - lots of good info there and practice can help you immensely when you are in your game. Jumping right in I know what is wrong with your game. But we need to check one thing first. Hopefully you have a manual for your game, or download one from the Internet Pinball Database. In there you will find instructions on how to use the diagnostic buttons on your coin door. And on your coin door frame are two switches that open and close with the coin door. To check any high power items like coils or flashers you need to enable the high power switch so high power works in test. Hold in with your fat finger is good enough. Find coil test, stop on right gate, and check it - does it open in test ? Most likely it will. Moving on your game's error alert system know absolutely nothing about coils ( gates ) it does know if a ball went by and hit the next switch in the lane where the ball goes. You need to figure which switch that would be, left or right past the gate. 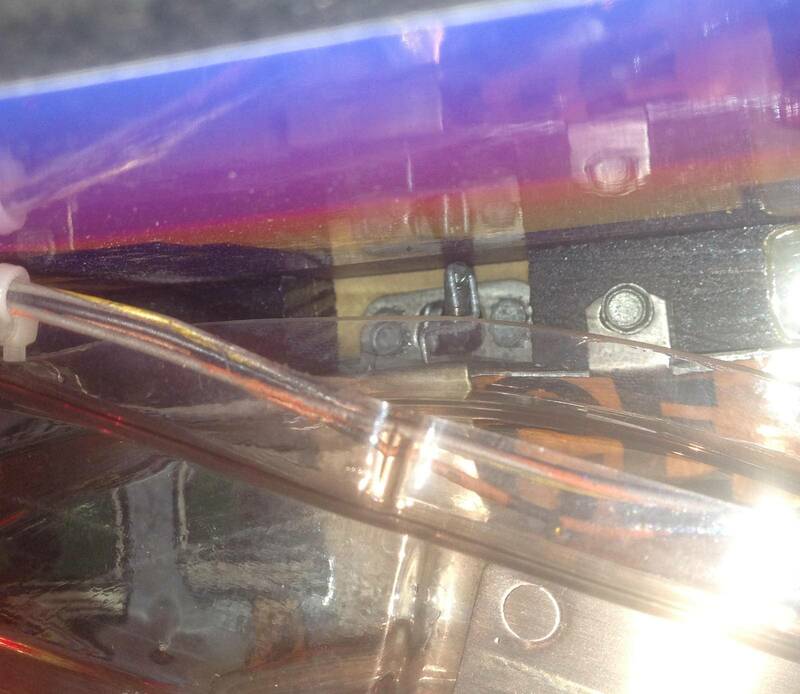 Now I could waste time and tell you all about switch edge test and check that switch and it will work in test. But it is failing in game play. Your machine already told us that. You need to replace that switch with a new one. The old one is gunked up inside with flux or something. When you replace the switch get the wires in the same spots and the silver band end of the diode facing the same direction. It should be pretty simple and a good way to get your feet wet so to speak on learning more about your game. I just did this exact fix to my DH a few weeks ago. It's nice to hear the chopper now! But OP said "the little metal gate stops the ball from going through". That sounds like a mechanical problem. OP, any chance of a picture so we can help you better? Check the arm/spring that pulls it, spring might be broken or slipped out of place. Mine was the spring. It's such a pain to get at. Your best bet is to pull off the backboard. 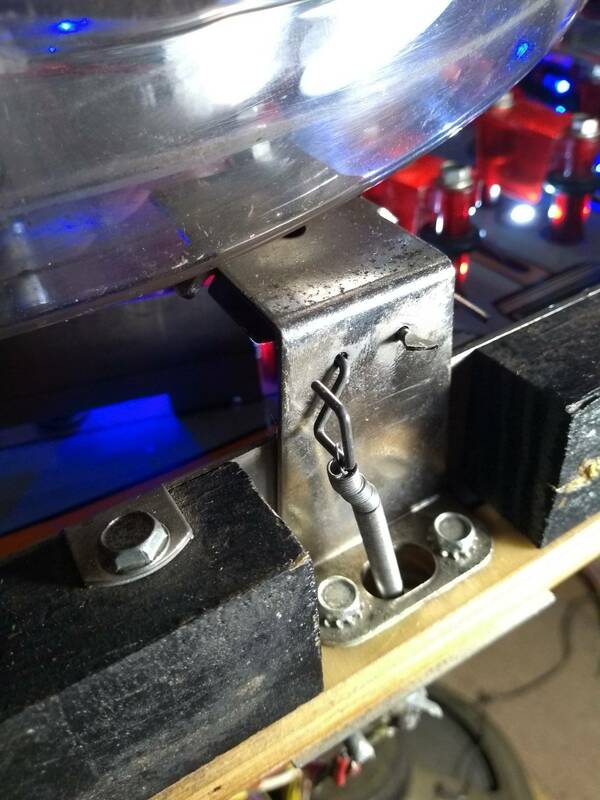 You have to pull the playfield all the way out and reach behind the backboard to get those screws... Then put the playfield up and get the screws that attack the backboard from underneath. This will give you better access to the spring. Here's a bad video of the test mode. Thanks so much everyone for all your help! I'm gonna try and mess about with it when I get home. hey ya'll, just got that spring back on that hook!!! Thanks for all your help, my first pinball repair is done! So much more to learn. Big ups to everyone again i'm super duper stoked right now!! Think that was one of my first repairs too. Congrats! hey ya'll, just got that spring back on that hook!!! If it slips up and off again, a tiny cable tie on the wireform above it will prevent it from happening again. LTG, this just happened to me and I am going to do the little cable tie above it so it doesnt slip off again. Good thought. I sure love Pinside. This post is a few years old and answered my issue. Spring fell off the metal arm deal. Works like a charm now! Worked like a charm! Removing the backboard sure made it a lot easier. Thank you Pinside! Hello everyone, I got a Dirty Harry Pinball, I'm doing tests and everything. I have a problem in the Gate Loop, the solenoid works however the spring is in trouble, the correct position of the spring would be like the image? Does this gate block the passage of the ball? Any tips thank you very much.